Arguably the most iconic representation of the United States 2008 presidential election, Shepard Fairey’s ‘HOPE’ poster swept across America and is still recognised and sought after today. Fairey was commissioned to create the image following the popularity of his earlier street art critical of the George W. Bush government. He chose to create this image because “[Obamas] power and sincerity as a speaker would create a positive association with his likeness.” Originally the poster was to have the tagline ‘Progress’ with Fairey’s signature ‘obey’ star, however this was changed due to concerns of negative connotations of the original wording. Originally the text was created solely for the 2008 campaign, however as Laura Barton from The Guardian states “[the image] acquired the kind of instant recognition of Jim Fitzpatrick’s Che Guevara poster, and is surely set to grace T-shirts, coffee mugs and the walls of student bedrooms in the years to come.” Due to this instant recognition idea, the association of this text is no longer exclusive to a poster for the 2008 election. The image can now be found on T-Shirts and various other merchandise. Arguably there isn’t one single producer for the image, rather the whole 2008 Obama Election team are the producers whose goal is to push the ideas of Barack Obama. Obama secured his reputation as a powerful and sincere speaker throughout his political career. He gained a rapport with the American audience, Fairey utilised this rapport and Obama’s speaking skills as the basis of his ‘Hope’ poster. The connection between the producers and the American audience is vital to the understanding of the text. Without Obama’s speeches and general social interaction, the text would have little to no meaning to the target audience. Furthermore, Obama’s speeches often centralised around three key ideas: change, “yes we can”, and hope. As Hope is a crucial idea throughout the campaign, using it in the poster reminded audiences of the key statements of the campaign. The simplistic nature of the image has also allowed for many people to create satire of the image, effectively turning consumers into producers. An audiences interpretation of the text raises some important questions, however the image raises more responses than questions. Questions raised through and about the text include; why does the simplicity of the text appeal to the audience? What makes the text so iconic that it acquires an instant recognition? Why is the text still talked about today? Would the text have had the same effect if it stuck with the original ‘Progress’ instead of ‘Hope’? Was Obama’s sincerity and power essential to the poster or would it work for anyone else? 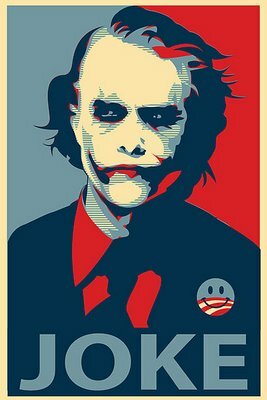 In conclusion, the iconic ‘Hope’ poster was an effective text for the 2008 presidential election, which still has contemporary uses. The connection between the producers of the text and the audience allowed for satirical images to be made thereby connection producers and consumers. Lastly, as with most artwork, the text raises many different questions.